Some Women Are Funny, Get Over It. This exhibition celebrates the determined agency of five artists to overcome the environment in which they work while simultaneously being inspired and challenged by it. The very contemplation of creating a work of art in Gaza is an act of defiance. The fact that it is exhibited here in London is an act of defiance, as is the mode in which London audiences may interpret it. All five artists are emerging talents in the Middle East. Each artist – Majed Shala, Shareef Sarhan, Nidal Abu Oun, Raed Issa and Mohamed Abusal – tells their own story: the conscious choice to use vivid colours, the hopeful form of a pregnant woman, the playful and detailed depiction of symbols such as the cactus, symbolic of endurance, or the use of shapes identified with traditional calligraphy, but which are never resolved into meaningful text. The artists’ power is evident as they transform ugliness and despair into beauty and light as the mundane forms of concrete, satellite dishes, asbestos roofs and washing lines are presented to us. 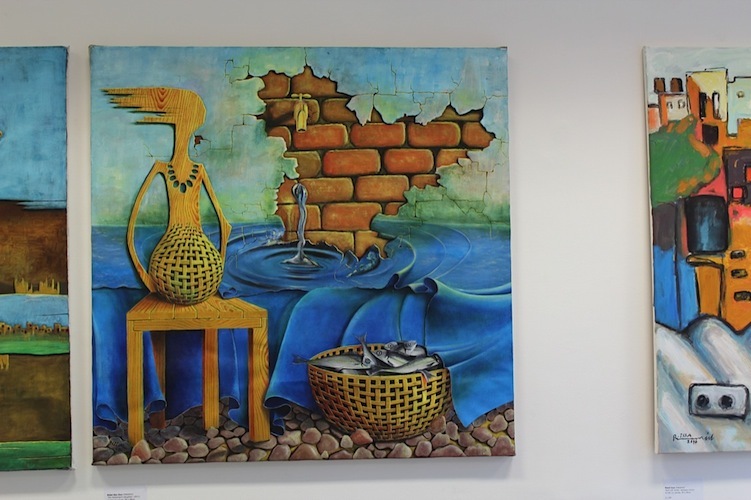 Exhibition took place 19 April – 6 May 2012 at The Stone Space, 6 Church Lane, Leytonstone E11 1HG. Items of art work are on sale. Please contact info@artscanteen.com for more information. Aser El Saqqa is Director of Arts Canteen Ltd. He is a curator engaged in the development of visual arts and music events which bring emerging artists from the Arab world to the UK. He is a Palestinian, born in Gaza and based in London.